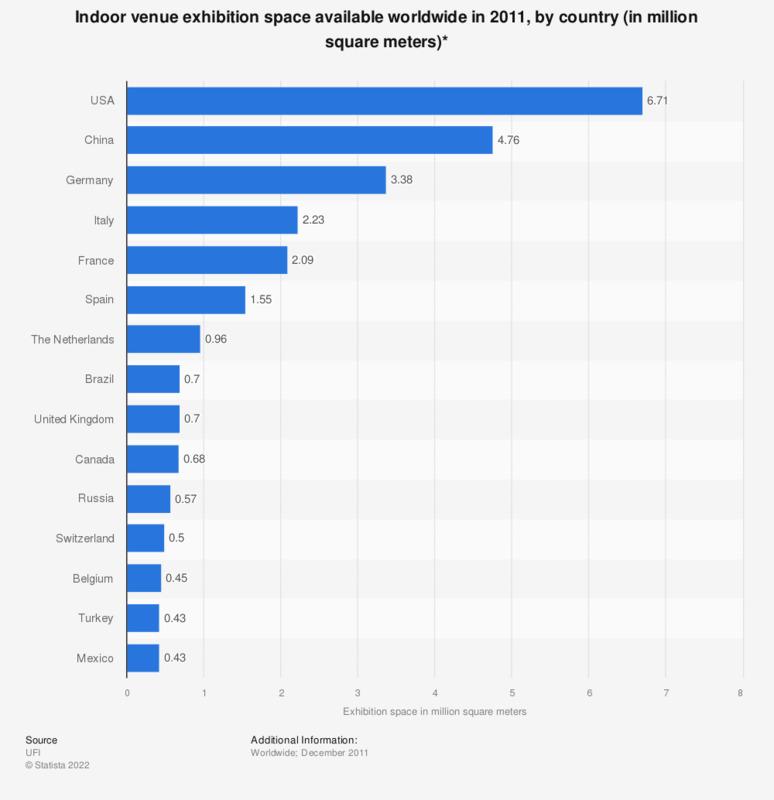 This statistic shows the indoor venue exhibition space available worldwide in 2011, by country. In United States, there was approximately 6.71 million square meters of indoor venue exhibition space in 2011. The global B2B events industry generated 29.3 billion U.S. dollars in revenue in 2015. Although the United States had the largest indoor exhibition space available, the largest exhibition hall was not American. In 2016, the largest exhibition hall in the world was the Hannover Messegelände in Germany, with a gross hall capacity of 463,165 square meters. * Exhibition space – the amount of gross exhibition space in the venue regularly marketed and rented/licensed/used for exhibitions, trade fairs or consumer/public shows. Venues with a minimum of 5,000 sqm of indoor exhibition space. Statistics on "Exhibitions, conventions & meetings in the U.S."